Let’s start over…for just a second. 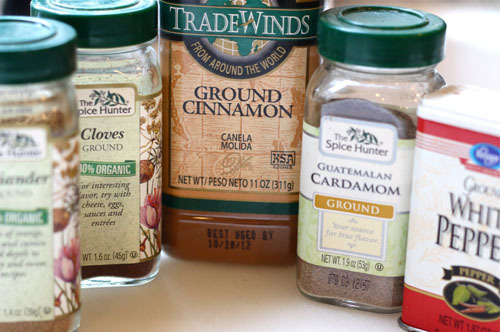 Go get some spices; Coriander, Cloves, Cinnamon, Cardamom and White Pepper. Open up the jars. Take a whiff of each one. Now, walk over to the chocolate drawer. What?! Don’t you have an entire drawer of your fridge devoted to chocolate? If you answered, “No”, then I suppose I should start with that lecture, but I’ll save that for another day. Eat one, good and dark chocolate chip…bittersweet if you have it please; just to set the scene. 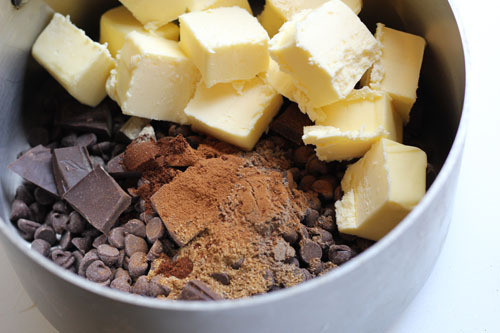 In a medium sauce pan, place the bittersweet chocolate, butter and spices (coriander through pepper). Heat on medium, stirring frequently with a wooden spoon. Turn lower as it starts to melt, stirring frequently. 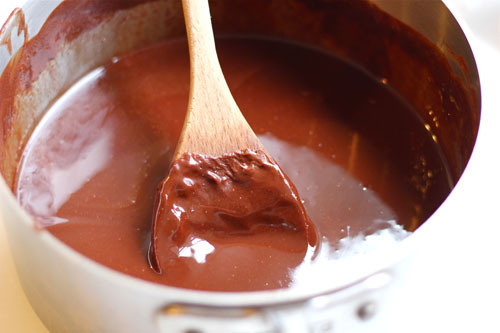 It will take about 4 minutes for the chocolate to totally liquify and the ingredients to meld together. Once that happens, take it off the stove and let cool while you make the rest of the batter. If you are making these ahead, cover themwith plastic wrap and then you can refrigerate them for up to one day. When you take them out of the fridge, you must bring them to room temperature before you bake them. Bake for 15-18 minutes, until the batter has risen above dish, top edges are dark brown, and centers are still soft and runny, about 15 minutes, or about 18 minutes for refrigerated batter. Decadent! Decadent!! Gosh…I want one too! Oh my gosh, this looks so cute and yummy! 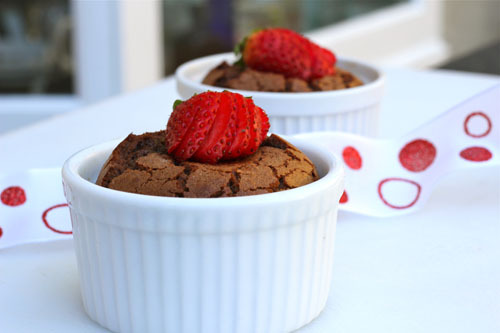 Great minds think alike, Geni…I was planning on making molten chocolate cakes for Valentine’s, too, and my recipe is from Bon Appetit. But now that I’ve seen your spicy version, I think I’ll add some to mine as well. 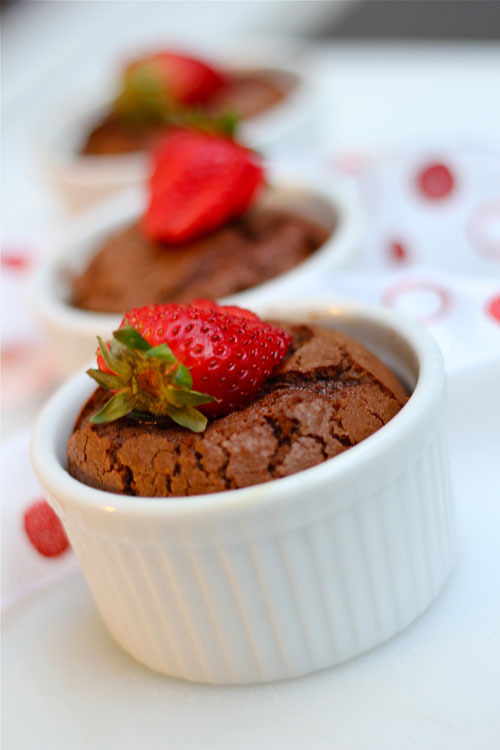 Your cakes look perfectly puffed and beautiful with their red strawberry garnish…VERY Valentine’s. Wow. These do sound spicy! These must taste incredible, Geni! I bet the aroma is even better. That’s some mix of spices in that lava!